« Soup……..to warm your soul! No heaven can come to us unless our hearts find rest in it. May you be with the one you love…. May you love the one you are with……. May you be loved for all times………. May you hold love in your hands……. Wrap the dough into plastic wrap and…. Dust your board with a little flour and…. 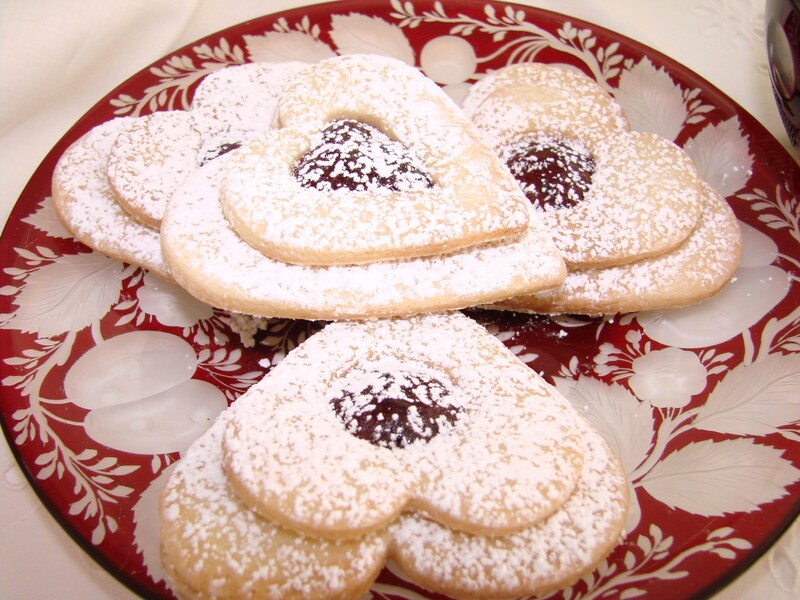 With a cookie cutter cut out the heart shapes…..
make a window in halve the hearts……..
Bake the cookies on parchment paper at 375 F until barely browned…..
Make sure they are light brown or almost still white….because the cookies will continue browning when you take them out of the oven….. When cooled use your favorite jam……I like to use plum or raspberry …. and make sandwiches with the baked cookies…..
Then dust them with confectioner sugar and …. When I read this “friend Valentine poem” I knew immediately who I want to dedicate it… to you Maja! P.S. I love the old world ruby crystals! What a wonderful poem? !…..you are so sweet!!!!!!!!!! Thank you……. for sending it with thoughts of me…..
Celeste………..how very nice to hear from you!!!!!!!!! I do miss you…..and have not seen you in ages!!!! Pop in sometimes for that cup of tea and a little heart……..we need to catch up!!!!!!! What a lovely message – thank you Maria. Enjoy Valentine’s Day. Your cookies look yummy!!! for your nice comment! I wish and hope you are having a wonderful Valentines Weekend as well……. 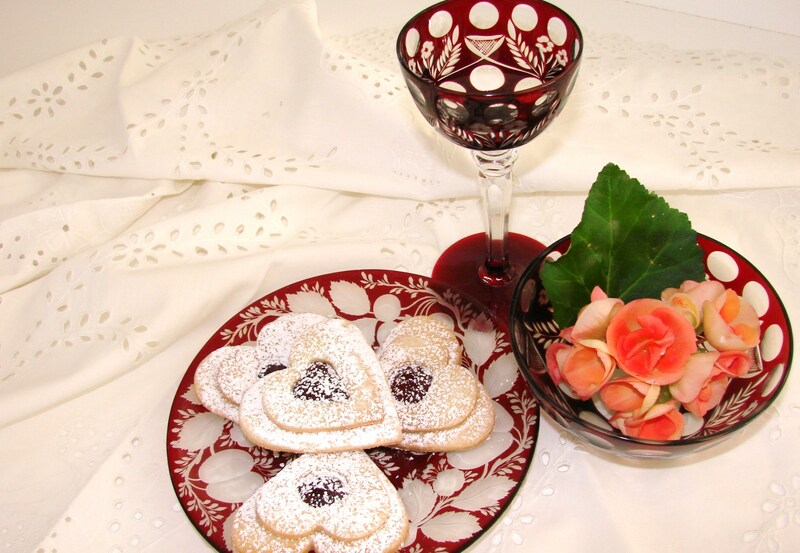 Those Linzer cookies look great indeed and the glass plate, that I understand is not longer made, is lovely. We used to have a “bombonniere” of the same color, alas, it broke. 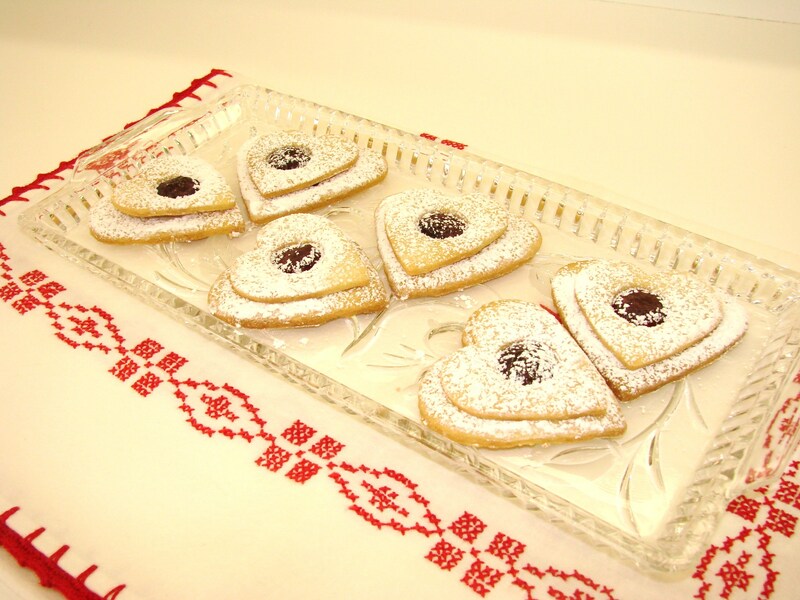 I wanted to share a Linzer Cookie recipe that I use at Christmas which is always a bit hit. The dough is very elastic and easy to work with, but I have had to add a little lemon juice because the cookies came out very bland. In a small bowl combine flour and salt. In a lrg. bowl, cream butter and sugar until light and fluffy. Beat in the eggs one at a time, beating well after each addition. Gradually add the flour mixture and beat until smooth. Divide dought into two portions, wrap in plastic wrap and refrigerate 4hrs. or overnight. The rest of the instructions are the same as yours. For Christmas I use two different size circle cutters. The recipe comes from “Christmas is Cookies” with forword by Mara Reid Rogers spokesperson for The Everyday Cookbook. Hope it will be spring soon in Maryland and that your family is doing well. 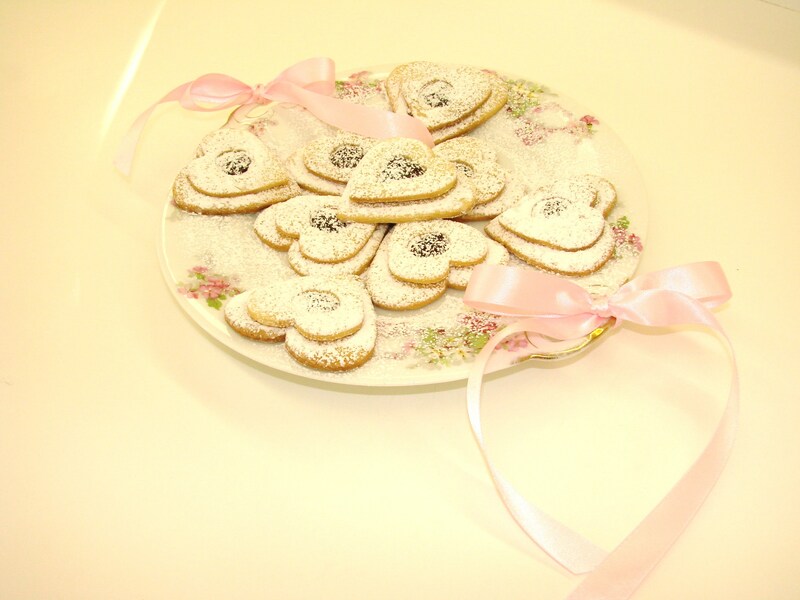 It so nice of you to share your Linzer Cookie on my blog………thank you! I think to add some lemon juice is a great idea since there is no flavoring in the recipe. Thank you again for sharing your favorite family Christmas cookie……….. I think I remember that Bonbonier…. was it from your parents home??? I am sorry it broke……….. So pretty. Now THOSE look Austrian! Such beautiful thoughts! Having tasted your Linzer Torte, I know these cookies must be out of this world! Wow- thank you for the lovely Valentine’s thoughts, and the great recipes. Happy Valentine’s day to you and your family as well. Is it X-Mas again? These cookies are really yummy,yummy,yummy….Did you bake them???? Tell the truth…!!!! I… baked these cookies……I am telling the truth…….and it does look like Christmas….does it not……..? Das nenn ich mal Vorbereitungen für den Valentinstag….kann man die per Post bestellen? Your blog post is really quite lovely Maja. Wishing you a bounty of love and happiness. Maria, your cookies are absolutely beautiful! Thank you for your Valentine’s wishes and recipes. May you and your family have a holiday as lovely as your cookies! It’s always good to hear from you. Happy Valentine’s Day to you as well and Thank you for the thoughts. Your “maja” valentine was inspirational. You tapped in to your poetic heart and shared some delicious moments with a kindred spirit. Gruess Dich, Maria, vielen Dank fuer die lieben Valentine Gruesse, die ich ganz herzlich zurueck schicke. Das Rezept fuer die Herzplaetzerl hab ich schon seit Jahren und backe sie jeden Valentine. I believe I goofed. Now I’m receiving your blog twice!!! I love Linzer cookies! Haven’t made them in quite some time though.